"When you come here and say you are going to do something of human interest, it makes a person wonder if you're going to do something of interest to other humans, or whether you consider the person human in whom you're interested." In the late 1960s, filmmaker Haskell Wexler decided he wanted to make a documentary-style film about racial tensions in Chicago. He decided to incorporate as much real footage as he could, to genuinely capture the growing racial, political, and social divide that was present in the city, and all over America, in the turbulent '60s. He chose Chicago not only for its varied racial makeup: it city was also the site of the 1968 Democratic National Convention. Wexler knew that if racial tensions were going to explode into riots and violence anywhere, it would be during the convention. And he was right. His cameras captured, in guerilla style, the rage of the public and the injustice of the authorities. He then used this footage as the centerpiece of a fictional narrative, resulting in a compelling commentary on the media, racism, and political strife in the Vietnam era. The fictional side of the story revolves around John (Forster), a detached TV news cameraman. The film opens as he and his partner capture bloody footage of a car wreck victim, making sure to get plenty of close-ups before they call an ambulance. John has the same detached attitude towards all his story subjects. He enters a black neighborhood to procure a human interest story about a cab driver who returned a bag of cash he found in the back of his cab, but it doesn't concern him that he is humiliating the man by making such a spectacle of his act, nor that he is not welcome in the neighborhood. He also meets Eileen (Bloom), a single mother with a precocious, jaded son Harold (Blankenship). He begins to pursue Eileen as well as mentor Harold (by teaching him to fight and "knock the other guy's brains out"), but it is unclear if he is interested in a relationship, or just another story. As tensions mount while the city prepares for the convention, John becomes more and more involved with the two, and perhaps more aware of how hardened his job has made him. The cast does a fine job with this material, and all seem suitably realistic amidst the documentary-style photography. Forster is a cold, calculating protagonist, and it is difficult to relate to him at times, as he does some really heartless things throughout the picture. But he is always able to inject layers of distant warmth and buried compassion in his scenes with Harold and Eileen. Bloom is excellent as well, though she isn't given much to do. Blankenship gives an especially honest performance as the young son; it doesn't feel like acting at all. Wexler's idea was certainly an intriguing one, and he manages to pull it off well enough. The picture does an excellent job of offering both a penetrating look at the racial and political tensions of the '60s, and a telling critique of the media and the public's fascination with violence. Often the camera is a silent observer of protests and police injustices. Anacronistic music calling for peace plays, even as the images make clear that sometimes violence is unavoidable. When the riots begin, we can't look away, because they are real—the violence is happening right in front of us. And, in the parting shot, Wexler turns the camera on his audience in an admittedly heavy-handed, but effective closing commentary. Perhaps the truly fascinating and horrific part of sensationalism in the media is that it finds an audience at all. Image Transfer Review: Despite being shot on several different types of film and in several different styles, Medium Cool looks very good on DVD. The biggest problem is in the condition of the print used—there's some scratches here and there and quite a bit of visible film grain. Colors look muted and realistic, appropriate to Wexler's original intent, but there are still some lovely, lively shots of the West Virginia countryside. Blacks look very strong, and shadow detail is decent. Edge enhancement isn't a problem, nor is aliasing. Digital artifacts are evident in a few busy shots of the Chicago cityscape, but it never becomes a major problem. This does not look like a film over 30 years old. Audio Transfer Review: This mono track is a bit tough to grade. In some scenes, dialogue reproduction sounds clear and supported. But moments later, the volume will drop, making some lines hard to understand. Moreover, in a few scenes, particularly the climactic riot scenes (or really, anything made up of real footage), the sound is sometimes a bit unsupported and shrill as things get noisy. There is no audible background hiss, however. Music sounds fine when incorporated into the mix. It's sometimes not very pleasant to listen to, but it is perfectly suited to the realistic, documentary feel of the picture. Speaking of music, some has been changed from the original release (according to the back of the box), but Wexler himself was involved in the new soundtrack and the result is very effective. Extras Review: Aside from the theatrical trailer, an oddity that runs over three minutes, Paramount has included a very nice commentary track with director/writer/director of photography Haskell Wexler, editorial consultant Paul Golding and actress Marianna Hill. Wexler and Golding do most of the talking, discussing the genesis of the project, the difficulty in putting it together, and the general mood of the country in 1968. Hill offers a few on-location memories here and there, and makes some good contributions to the track. It's an interesting listen overall, despite a few dull patches, and gives essential insight into this unique picture. Unfortunately, the 2001 TV documentary on the making of the picture, which ran on cable, has not been included. 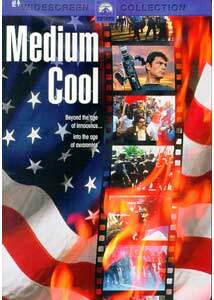 An interesting blend of narrative and documentary film, Medium Cool was considered revolutionary at its release, exemplifying the power of film as commentary. The experiment isn't wholly successful, but the result is often fascinating. Paramount has produced a fine disc, with an excellent commentary track.